I am a monkey. I am nine years old and a robust eight inches tall. I live with the personage known as “the boy”, my best friend Purple (an orangutan) and Cuz (my bookish cousin). In the year 2005, I hired the woman known as “Mama”, or in some circles known as “Heather Payson”, to be my typist. She is a woman of mystery with many identities and is a shockingly unreliable employee. Nonetheless, she helped me with a blog called “Monkey’s Deep Thoughts”. I had a small but fiercely loyal readership. The Guardian UK was moved to write about me, "… the fact that he's a small soft toy doesn't seem to have stopped a friendly chap called Monkey from sharing his inner psyche." I have no idea what they meant by “small soft toy”, but as we know, journalism is dead. “Soft toy” indeed! 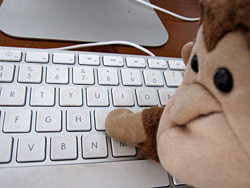 That blog closed, due to my treacherous typist’s capricious nature. I have since learned to type, which is harder than I had imagined. Furthermore, I have written a book! It is searching for a home with publishers as I labor over this very sentence. Wish me luck. And please… send bananas. Thank you.